I move between two computers regularly: my work iMac and my laptop. With few exceptions, I use the same applications on each. Those exceptions, however, need to stay running on my iMac even when I’m away. I have gotten in the habit of quitting the apps I will be using on the laptop when I leave the office. That means every day, the first thing I have to do is click a bunch of dock icons on the iMac to get my normal computing environment running. There’s got to be a better way, right? Of course there is. Task Till Dawn is Java-based freeware that will launch applications, open files, run shell scripts; if you can double click on it in the Finder, Task Till Dawn will open it for you on whatever schedule you set, and scheduling is what this application is all about. 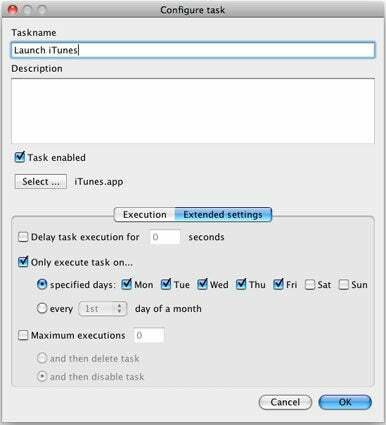 Among the scheduling options, you can set basics such as a recurring time every day (Task Till Dawn uses a 24 hour clock) when the application launches, or set more granular settings such as what days of the week the task runs, among others. As long as it’s running, as either a program in your dock or a menu bar item, the scheduled tasks will run. You can also enable Growl notifications to have Task Till Dawn inform you when it’s getting ready to run a task. On the down side, you only get one launch per task. I have five programs I want to open at the same time every day, but I have to create five tasks to accomplish that instead of assigning five applications to one task. Task Til Dawn is designed to do one thing, launch stuff, be it files, programs, shell scripts or other. It does this job very well, and you can’t beat the price.